Joseph Lia (Baritone) graduated in Music from the University of Malta. Supported by the Janatha Stubbs Foundation, he furthered his vocal training at the famous St Petersburg State Conservatoire under the tuition of Prof. Sergei Riazantsev, where he obtained a Masters Degree in Chamber Singing, Opera Singing, and Voice Pedagogy. Joseph is currently following a Doctorate Degree with the support of the MGSS Scholarship. He is fast making a name for himself, winning competitions both in Russia and Finland and taking part in opera productions in Italy, Russia and his native Malta. He has performed the main roles of Germont in Verdi's Traviata, Uberto in Pergolesi's La Serva Padrona, Ebn-Haki in Tchaikovsky's Iolantha and Dr. Malatesta in Donizetti's Don Pasquale. He is an accomplished recitalist, mastering the lieder and oratorio repertoire. ​Joseph has performed in venues of note, namely the Rachmaninov Hall, the St Petersburg Capella, the Glazunov Hall, and others. He seeks to promote Malta and Maltese composers in his recitals in St. Petersburg, Moscow and, lately also Rome, with the concert series Musica Melitense. 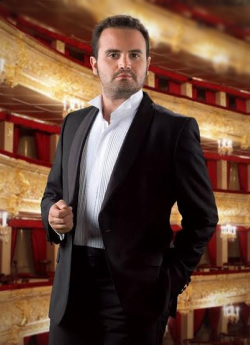 He has been invited as jury member in several competitions in St.Petersburg, and to give masterclasses in voice at the Vytautas Magnus University Music Academy in Kaunas, Lithuania, at the TISIA Istituto Universitario di Studi Musicale, Cefalù in Sicily and Elena Obratsova Cultural Centre in St.Petersburg, Russia. Joseph Lia is the Artistic Director of the Malta International Organ Festival.